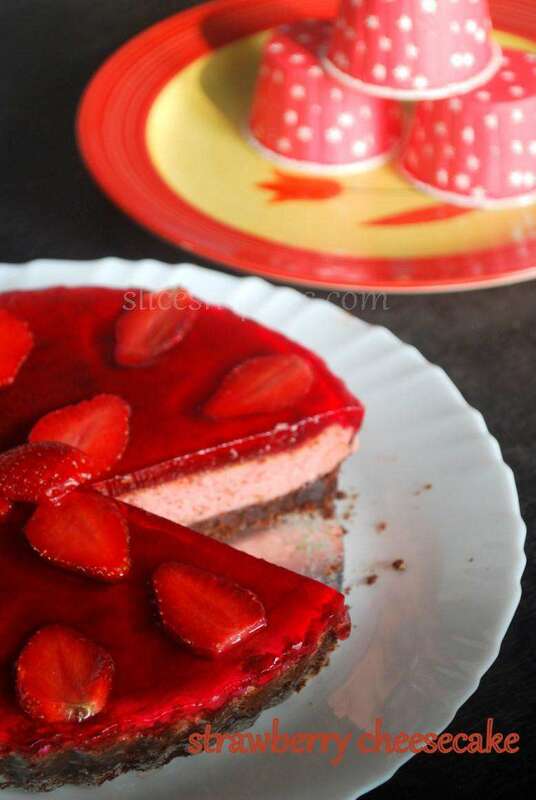 Strawberry cheesecake! 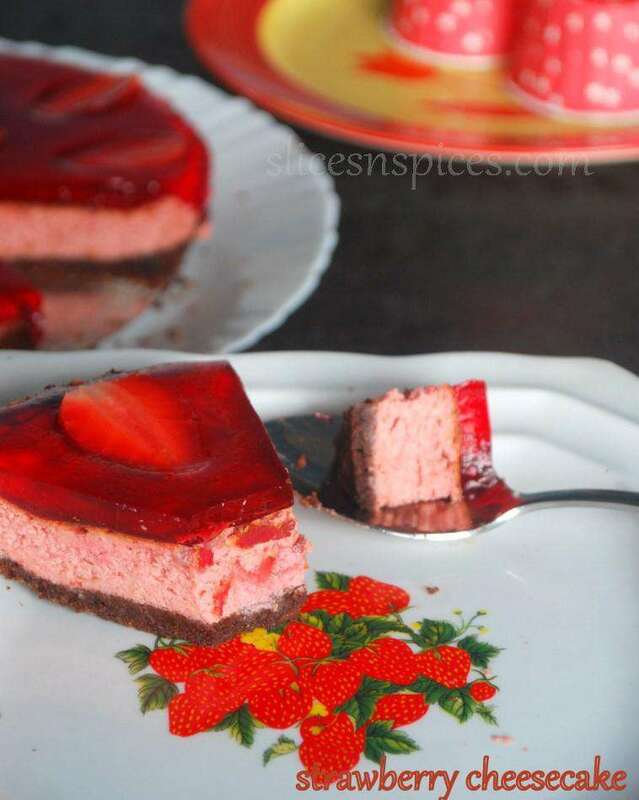 It’s the season of strawberries,and what a waste it would be if I don’t whip up a couple of desserts with this gorgeous fruit! After a strawberry cake and strawberry mousse last season, and inspired from mango cheesecake, I set out to make a similar one with these red beauties. We don’t get cream cheese here, but by some divine intervention we do get strawberries for a short period. So, we get two types of strawberries, very sour ones ( the ones with acidic overdose where you squeeze your eyes and nose after one bite 😃, available at the end of the season) and the less sour kinds, which can be used as a poor substitute for the sweetest kinds available in other cities. I was lucky enough to get some manageable kinds to make this cheese cake. And lack of cream cheese made me go for this method of using hung curd. There are many ways to substitute store brought cream cheese, and I found one of the ways by using hung curd. 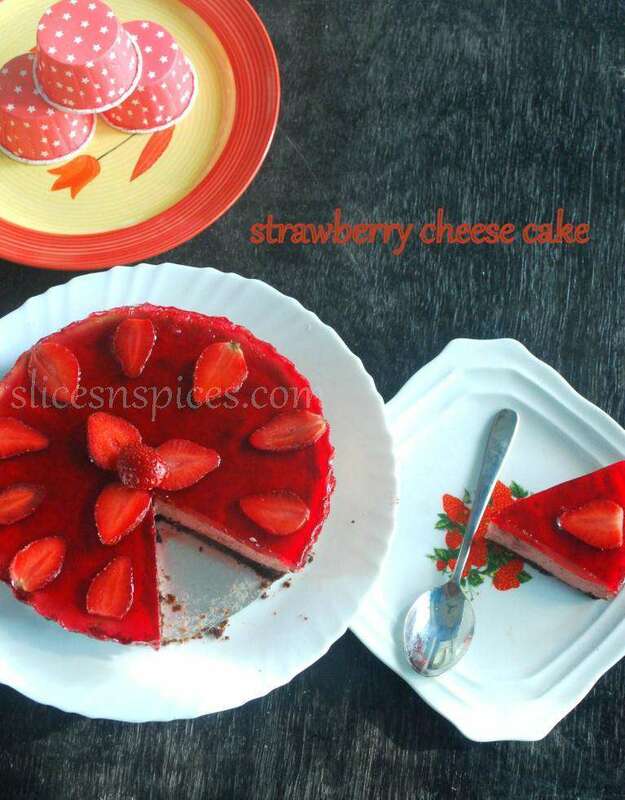 Since the strawberries were slightly sour ( the best we could find here), and I left the curd to hang slightly longer in refrigerator, my cheese cake was a bit on the sourer side. But a hint of bitterness in the biscuit crust ( I added more cocoa powder ) and the sweet jelly on top made up for all the extra sourness. Take a clean muslin cloth/ cheese cloth/ cotton dupatta and place it over a big vessel, pour the set curds, knot the cloth and leave it hanging in refrigerator. Alternatively , you can also keep the tied yougurt inside a big stainer and place it over a vessel to collect the liquid. Place this entire set up in refrigerator. Allow it to drain for 4-5 hours in the refrigerator, you will get roughly 1.5 cups of hung curd after the whey seperates. 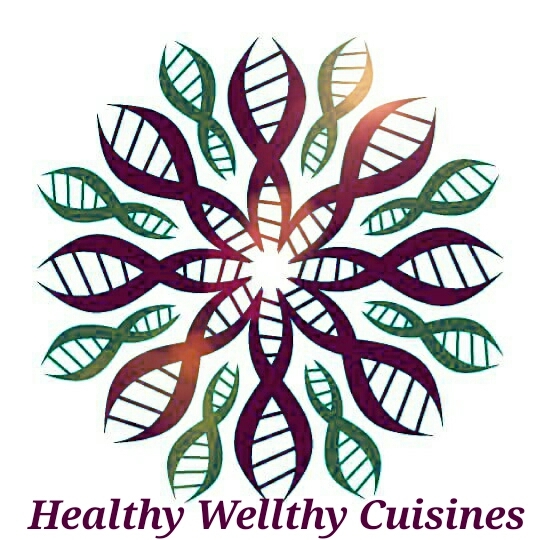 To know how to make curd from full fat milk, please refer here. Either directly use low fat curd to make hung curd for the recipe and later on add 2 tablespoons of thick cream while making the cheese cake batter like I have done in the present recipe, or before setting curds while boiling milk add amul cream to the milk as I have done in this mango cheesecake. Either ways the results wont be much different. Grease and dust a loose bottomed pie tin/ spring form tin. If either of them is not available, you can use a normal baking tin. Line it with aluminium foil at the base, length wise and breadth wise, with some extra foil folded over the edges, so that the final cheese cake can be lifted using foil like flaps. Bake it for 8-10 minutes, take care not to overbake and burn the crust. Meanwhile, prepare the mix for the cheesecake by whiping hung curd, condensed milk, fresh cream and strawberry purée. Mix in sugar and cornflour, check the taste and add some more sugar if required. 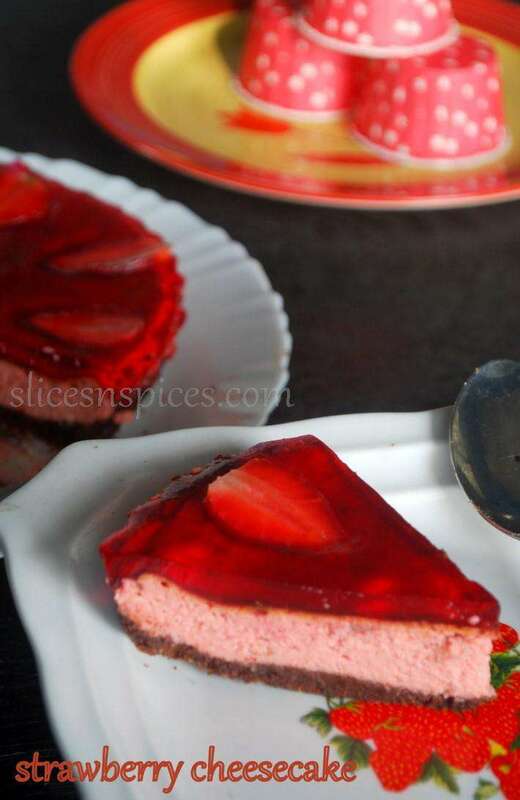 You can also add chopped strawberry pieces. Bake it at 180 degrees C for 45-55 minutes. The cake is done when the surface starts to turn brown, and when you shake the tin, the cake is set,doesnt move much, except for small jiggling at centre. Let the cake come down to room temperature. When it is cooled sufficiently proceed with the glaze. Note:I have used a 9″ x 2″ loose bottomed pie tin, you can use a spring form tin. If both are not available with you, use a normal cake tin, line it with aluminium foil at the base, length wise and breadth wise, with some extra foil folded over the edges, so that the final cheese cake can be lifted using foil like flaps. 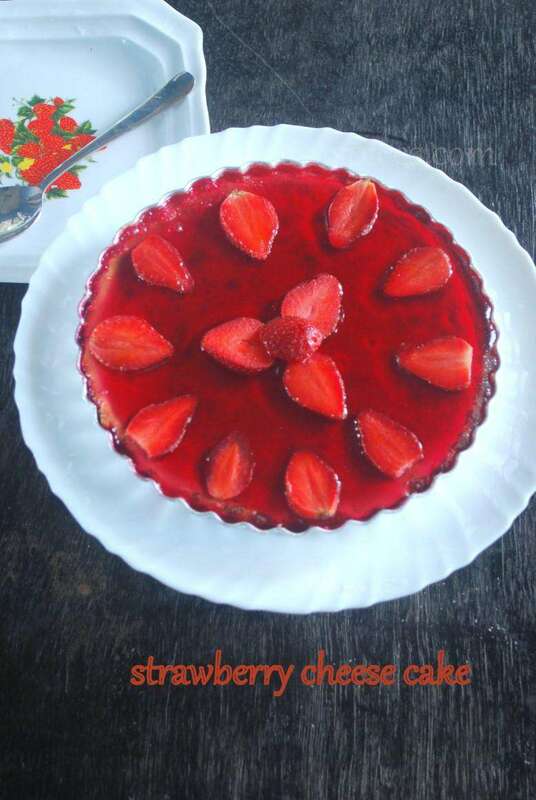 I used ready made strawberry jelly. You can make it at home if you have agar agar/ gelatin at home. please refer here. Just replace the mangoes with strawberries. Before the jelly sets, arrange the slices of strawberries in any pattern. After decorating, chill the cake in refrigerator, preferably overnight. The cake tasted best after 24 hours of refrigeration, allowing the flavours to mature.